An observation from Jon Page, of Pages and Pages Bookstore, who was re-watching Season 4 of The Wire. He was moved to tweet that it was "the best written piece of drama (novel, TV, movie) ever" - which kick started a conversation conducted in 140 character bursts. The Wire lovers tumbled out of cyber space to wax lyrical about the show and debate Jon's suggestion that a TV drama could go close to having the depth, complexity, and weight of a novel. It later moved on to Facebook, where there was a bit more room to talk about the ideas. Not being one to waste words, I've taken my contribution to the conversation and tidied it up a little bit for the blog. I was thinking about what it was about The Wire, that for me, made it perhaps the most powerful piece of dramatic fiction (written or visual) that I'd ever come in contact with. It certainly stands as a powerful piece of crime fiction, and towers over every other crime genre TV drama yet made but I think it was doing more than that. When looking at it in the terms of a novel, I feel that the sheer scope of The Wire does what few other single novels do. Whilst the old-school of, for example, Dickens and Tolstoy certainly didn't shy away from vast sagas, big casts, long sweeps of time and history, there is a tendency in contemporary fiction to choose to go small, even if the "issue" is big. The focus is usually on an individual or small handful of individuals, even if large sweeps of history are taking place outside. The increasing popularity of the 1st person narrator also tends to preclude a vast narrative sweep in which a range of characters present their stories. 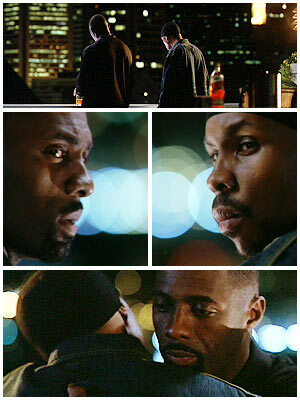 The Wire is structured in five seasons, with each season being similar to a novel, each episode a detailed chapter. As the seasons went on, The Wire just built and built and built. It kept filling out a rich and detailed cast of characters, who were all interrelated, all connected organically by the city of Baltimore. As the seasons passed characters died, minor players grew into major ones, the focus shifted from the streets, to the schools, to the media, without ever forgetting any of these places on the way, and all the while five years of life in a decaying American city unfolded. Seriality is not new in crime fiction. It's one of the characteristics of the genre, and that feature is often raised as a reason that it fails the serious literature test. In all honesty, the serial nature of crime fiction and its investigators is not often used as effectively as it could be, becoming a dilution of story rather than a strength. This is why, for me, The Wire raised the bar on crime fiction writing. After seeing how long form serialised drama was used on The Wire, seriality should no longer be seen only as a lazy shortcut to writing the same book, over and over again. Instead it should be the key to developing complex, nuanced characters and places of rich texture, that grow and change and have decided effects one upon the other. In trying to think of "crime" that has had such a broad scope, Ian Rankin was one of the first crime writers to actually place his detective in "real" time, have him age and change, and interact with the real world. James Ellroy's LA Quartet set in the post-war Los Angeles had a recurring cast of characters who moved through the world of the novels. I have The Red Riding Trilogy DVD set on my shelf to watch soon, based on David Peace's Red Riding Quartet of novels which cover a decade in time. I'm hoping that The Wire will have an impact on crime writing, not just on TV drama production. It's no coincidence that crime writers worked on The Wire. Pelecanos, Lehane & Price formed a real synergy with Simon and Burns to produce something that took storytelling to a new place. They managed to marry the pace and narrative of the written form to the visual form and the result was extraordinary. However, there are somethings The Wire does which a book cannot. Visual storytelling can do things that, when done in a novel, are not as obvious or as effective. The Wire featured a cast that was predominantly black. Something that is not often seen on American TV, and not seen at all on Australian TV. In a novel this just does not have the same impact. You can describe the characters and name them, the reader can register their ethnicity, their colour, their appearance, and then the reader gets stuck straight back into the story. But remember watching the first few episodes of The Wire? They were confusing, hard to follow. Well, because for most of us viewers we were not that used to seeing so many African American faces all at once in the one show. Most mainstream movies and TV shows usually feature "the" black character, (the Asian character, the Hispanic character, etc) and perhaps his/her family. Generally there is not an entire community of non-white faces who appear all on the screen at once, all in the same scenes at once. I'll freely confess that it took me time to figure out who was who. It took me time to be able to tell Stringer Bell and Avon Barksdale apart. That was confronting. That told me, the viewer, a few things about myself that I wasn't all that proud to discover. Not only that, but the language these characters were using was a barrier. That could be solved by (belatedly) turning on the sub-titles, suddenly the "ya feel me" code was cracked, and I could identify the characters by name (Poot? Wee-Bey?) but the makers of this show (as Simon has said in many interviews) deliberately set out to make the viewer work, and to discover something about themselves as they did. The Wire, in this way, kicks arse, both visually and literally, and does things that a novel can't do. But I know I'm looking to it for inspiration in my writing because it has set the bar, for brave, honest, storytelling, for characterisation and scope, for showing how to turn a political thesis into gripping human drama, in whatever format you are working in. PS. Draft of Book 2, finally finished. A few little seams to sew up, buttonholes to add and remove. And it's off. I love The Wire. It's Dostoevskian, not Dickensian... Also love Deadwood for its linguistic spread and complexity. Disagree about the ethnicity of written characters. Easy Rawlins could be nothing but black - it's a very L.A. diction: pained determination to be gramatically unimpeachable by official white standards. Mosley's / Rawlins' attention to the minutiae of racial discrimination is meticulous. In that sitch you become very aware of your own eye-movements, and everyone's.